So I recently had an answer to the question ‘what will I sew for once my friends are done getting married?’, and that answer is: work-related black tie events. 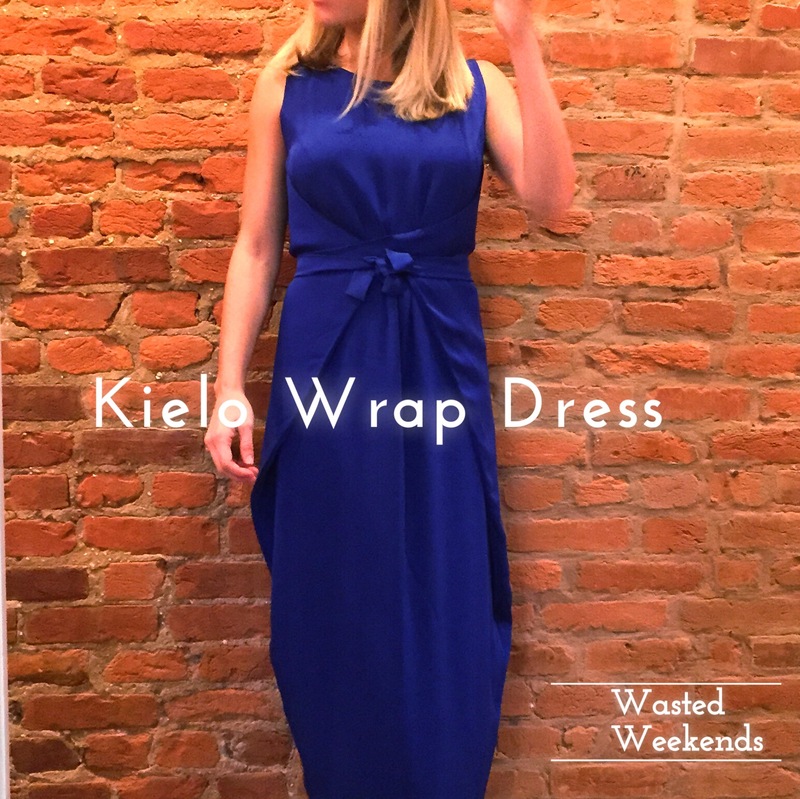 This is the Named Patterns Kielo Wrap dress, and I really like it! There were several of these on the internets, I liked the pattern envelope image. But I wasn’t particularly motivated to buy the pattern until I saw these two iterations of the dress. 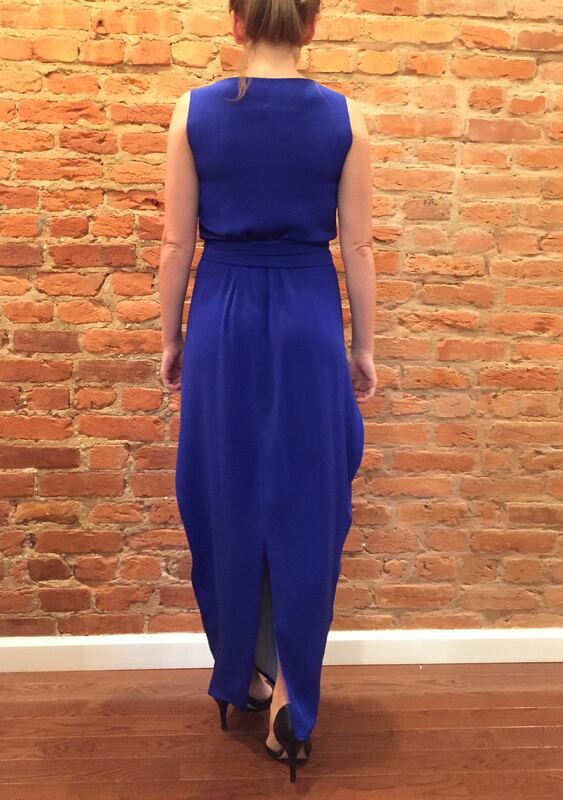 I had already picked out this royal blue stretch silk from Gorgeous Fabrics, initially to make this dress. But after some last minute second-guessing and spousal nose up-turning, I rededicated it to this Kielo! Unwrapped, the dress is essentially shaped like a curvy hexagon, with tails coming out of the side corners. It also mildly resembles one of those squirrel suits that mentalists wear to jump off cliffs. This is not for cliff jumping. Wrapping it looks like this! There are only three pattern pieces: the front, which is cut on the fold; the back, which you cut two of, and the wrap ties. :: reduced 1/2″ at bottom notch. Suffice it to say, I was lucky I had left those dart tails loose. I unpicked the darts and redrew them to stop an inch short. And now it’s fine! ::I underlined. For a formal dress, this was really necessary. The soft drape and thin hand of my fabric would have put all kinds of things on display, so I underlined with a silk stretch georgette that happened to be cheap at Fabric Mart when I was in the market. Underlining was horrible. The crepe and georgette are fiddly and finicky and getting the two layers to match up in order to be basted together was the single most time-intensive part of this project. It took a days-worth of sewing time. Also, if you are feeling very fussy, your underlining should probably be similar in color to your dress. See that white peeking out from the back vent? :: After hand basting the layers together, I then sewed them together using a 1/4″ seam allowance on my regular machine. This is because I didn’t yet trust myself to serge accurately. The 1/4″ stitching line serves as a guide in case you get your fabric a bit too close to the serger knife when finishing the seams. I’m a couple projects past this one now, and might be comfortable enough to take the training wheels off, but this was a good method for the time. :: I then serged all the edges, except for the hem edge. Assembled you can make out the serging and the stitching line. :: I assembled the dress. This took almost no time! It’s so easy. :: I catch stitched the seam allowances down by hand. 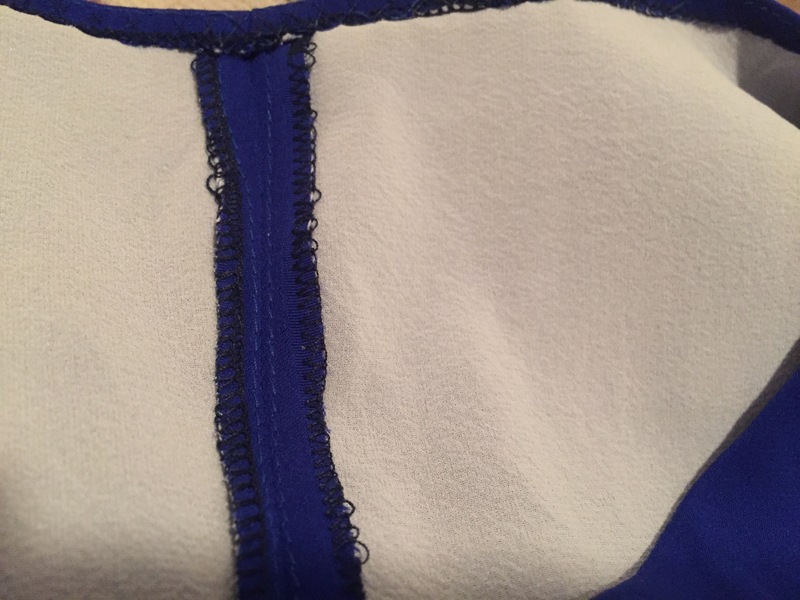 Because of the underlining, I was able to do this without catching the outside fabric, thereby avoiding itty bitty little catch stitching dents. It was tedious, but left a really, really nice finish. Also, I used blind stitch threat, which I did not know was a thing until recently. Glad I found out before this dress! :: And finally, I did a machine-rolled hem using a 6mm rolled hem foot. And then I got my hair did and wore that thing with a fake fur caplet to adult prom like I was supposed to do. Also! I sat next to a woman who also made her dress. It was an Elisalex. Weird world. Thank you so much! It was really fun to wear. Your dress is gorgeous, hope you had a lovely evening. Thanks! I did get lucky with that blue since I don’t live near too many honest-to-garment sewing fabric stores. The on-line inventories of a few places often dictate my selection. I’m in a bit of a blue period at the moment– I’ve got two more blue things to write up, though neither are quite this vibrant. I love the blue! Such an elegant and unique dress. It looks lovely on you! Thank you so much! It was a really good time to wear. That is a lovely dress on you. Several sewist have been making this dress-some with not so good results. Your dress seems like a perfect fit! Thanks!! I do think the fabric choice has an awful lot to do with it. I’m glad I didn’t let my lazy side get the better of me and skip underlining, because I think that keeps the dress from being too clingy. Yeah, that’s fair about the tracing and re-sizing. Honestly if I weren’t in the market for a formal-but-fast-to-sew dress, I don’t know that I would have ponied up the cash. I hope this dress is still summer appropriate! It’s pretty light, and we do have a wedding or two this year. 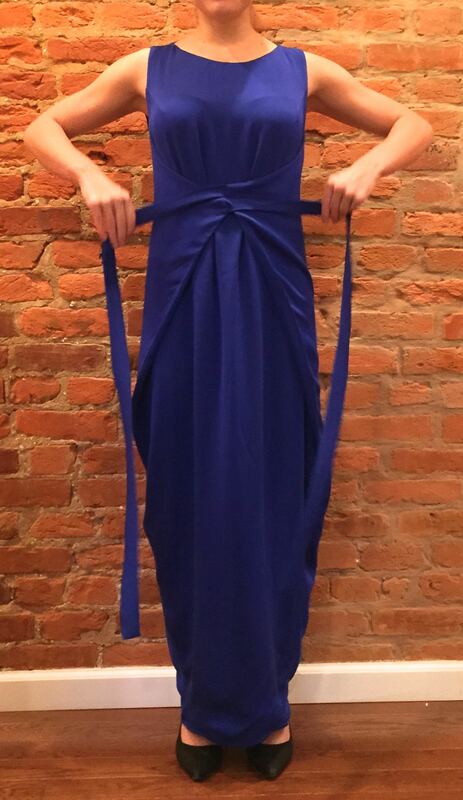 Wow, such a beautiful dress! Well done! Man. Lucky is right. I always wished I were like 5’8″ or 5’9″. I feel like that’s the height my spirit wants to be. My spirit does not like trying to hide the fact that I’m standing on my tiptoes when I’m talking to men in a group. But you know, can’t have everything! Thanks for making such a useful tool! Even on the patterns with seam allowances included I like to have seam lines marked, but I hate the tedium of making all those little tick marks. So this is great. Named is designed for taller women? I’ll be looking at them more closely…. and you look great! They are! I am jealous, then, of both your ability to make up those patterns without adjustments and your height! Beautiful dress in a beautiful fabric! …or you could make one for grocery shopping. you know, embrace the ‘one can never be over dressed’ idea to the extreme.